Curiosity is a funny thing. What’s over that’s ridge? What’s past that chute? What’s just around the bend in the trail? What can you see from the peak? A rustle of leaves just feet away behind a bush, a rattle from an unseen snake, a rock wall staring you in the face standing between you and a peak. What’s that? Can I make it? How far can I go? 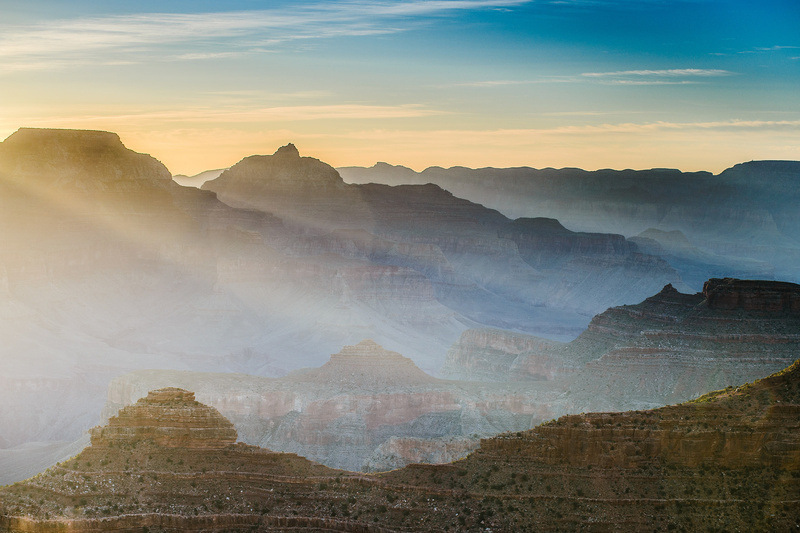 I remember looking at buttes in the Grand Canyon and thinking “I wonder if anyone has ever been up there.” I sometimes thought about what it would look like if you could paint the canyon with neon footsteps where humans have been since the canyon formed. It would be an awesome sight to see. How many people have stood where I have stood, touched the rocks I’ve touched, been the places I’ve been. Lastly, where has no one been, can I get there? The unknown; it’s the definition of adventure. There is always something else to learn, always a new adventure to have. If you get to the end of your fulfillment in one medium/discipline you push to the next or find a new way to push the current medium/discipline to a new level. Find something new to try, hone your craft, become better, explore, share your experience. There are so many places to see, experience, and there is no reason for you to ever run out. If you find yourself complacent, take a step back, appreciate what you love, and re-evaluate what is important. Remember that no matter how hard you try you can never fully know everything there is to know, there is a beauty in that. So be curious, it is a power that can propel you. Mazatzal (MAH-zaht-ZAL, locally Ma-ta-ZEL)- the origin of the name remains obscure but one possibility is that it is from the Aztec language meaning “place of the deer”. I saw tons of deer prints out there, but I think it should be “place of the Manzanita”! Talk about a plant thriving and on a mountain, there are 2 things I know about Manzanita 1) it is a very interesting looking plant 2) it is a pain to bushwack through and it only ever gets thicker as you try to push through it! Barnhardt and Y Bar Trails are night and day in terms if use, Y Bar is Chunky Munkey! 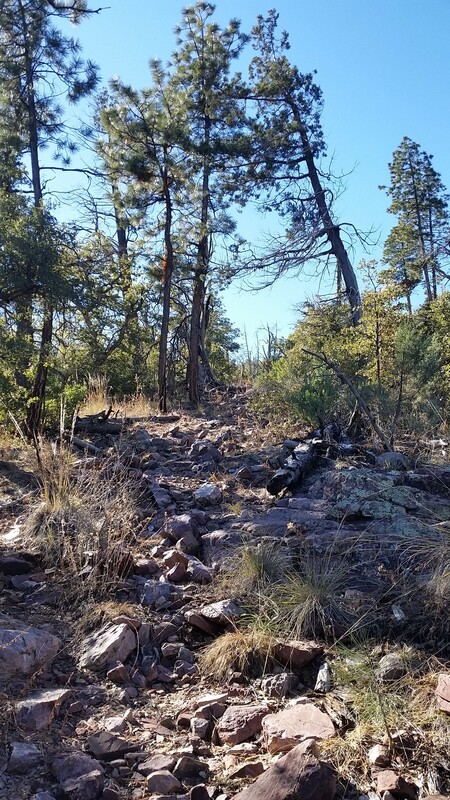 I planned on either trying a loop between Y bar trail, AZT section #22, and Barnhardt trails or taking on the peak via Y Bar trail. Either way I figured I would take on Y bar to begin with and see what time I had left in the day once I got to the saddle. Trekking solo I reached the cold trailhead with frost on the windows of the vehicles left there overnight. After getting my gear together and throwing on my pack I headed up the trail. I immediately found the split between Y bar and Barnhardt Trails, talk about a tail of 2 trails, Barhardt was padded and beat in where Y bar just looked much less traveled and chunky from the beginning. I knew I was in for a good push. Trekking up Y Bar, as I assumed, was chunky monkey. Baby head boulders everywhere just begging for you to roll or twist an ankle. I pushed up the trail quickly trying to shake of the chill from the morning. Y Bar circles the mountain in a South to Southwest direction diving in and out of canyons. Due the sun being low the trail was sunny heading into a canyon and shaded and cool heading out. 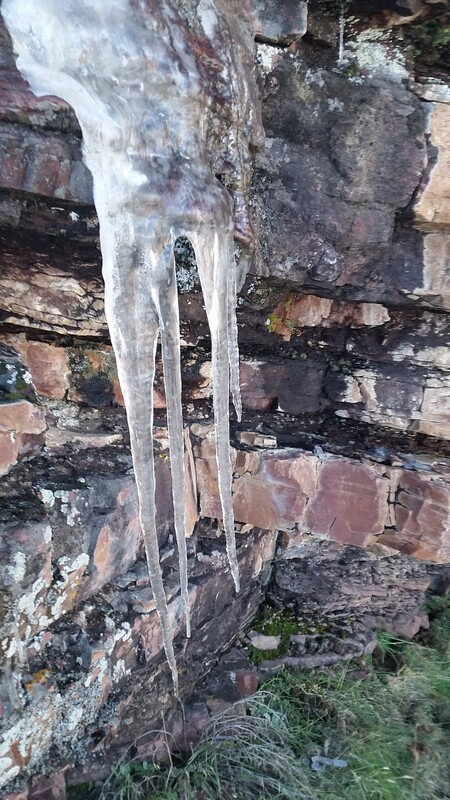 Ice was on the ground in the shaded areas and I found ice sickles in the running creeks down a few of the washes. I pushed on and up knowing the time was only ever running out on completing the loop, much less bagging the peak. 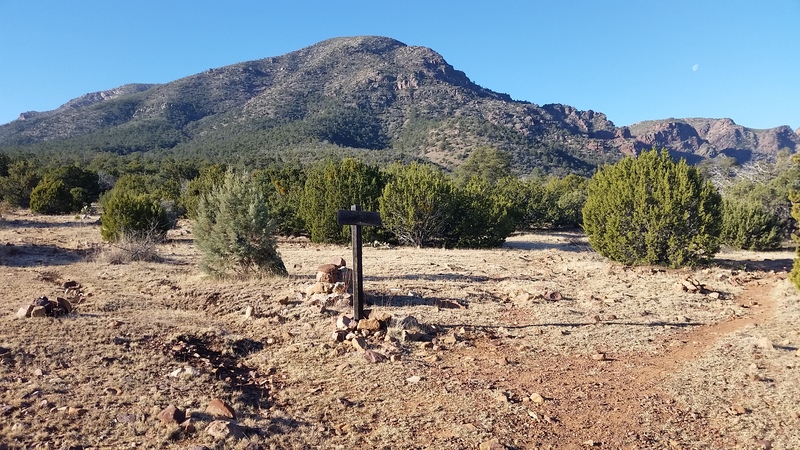 After a few dodges in and out of wash canyons the trail finally opened up into a westerly direction where I could see the main saddle where Y Bar tied into the AZT #22 with an option for the peak. I looked down into the valley below, what a beautiful sight to see! I kept pushing up the chunky trail to pleasantly pleased to find a small pine patch hidden on one of the washes just before the saddle. A forest fire took out many of the pines in this area but this small patch of pines shaded me for a brief moment on my trek. I finally reached the saddle and looked towards the peak, what a gnarly looking beast, it would have taken another 13 miles to complete my intended loop and it was already 11am (I got a late start). 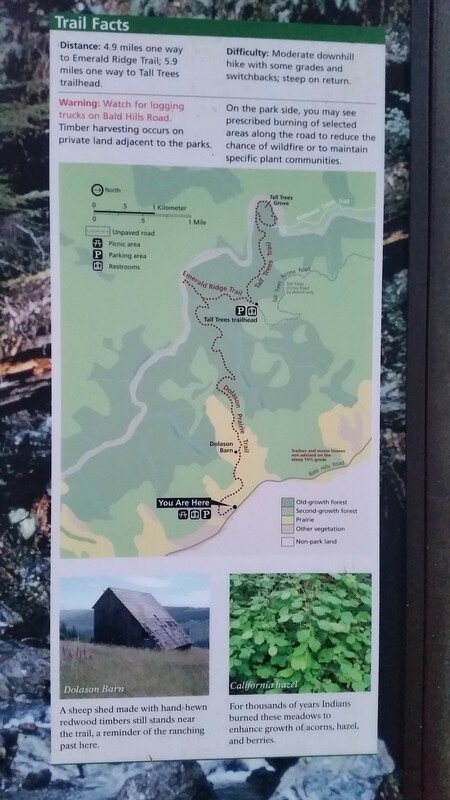 But it would only take me 2 miles of bushwhack round trip to the peak and a final 4 miles to get back to the truck in time before the sun set. I chose to push for the peak, try and see some of the views from the top. 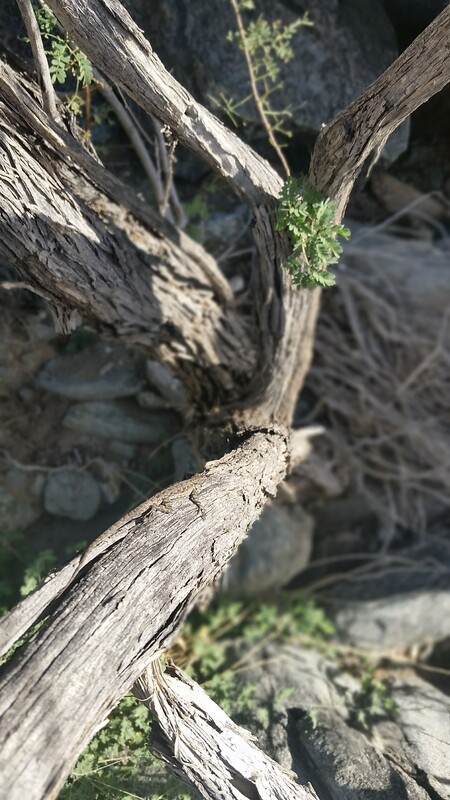 Instant Manzanita trekking. At first the going wasn’t bad, I pushed up until finding a large raised rock face impeding my path and I chose to sweep right around it. Once sweeping right I found a cairn which led me up on top of the rock face and back towards the west and eventually the ridge to the peak. A little rout finding got me on track towards the peak. The peak is up there somewhere! Lets go! There is no science to bushwhacking or pushing an off trail trail, you just kind of look at the terrain, look at topo lines, look around corners, follow cairns, intuition, use whatever tools you have to get you safely there. I pushed up and up along the ridge dead ending into low class 4 rock climbs which I decided to circumvent (solo trekking class 4 without gear isn’t the best idea for me) and soon found myself into a thicket of Manzanita. Whew was it thick! 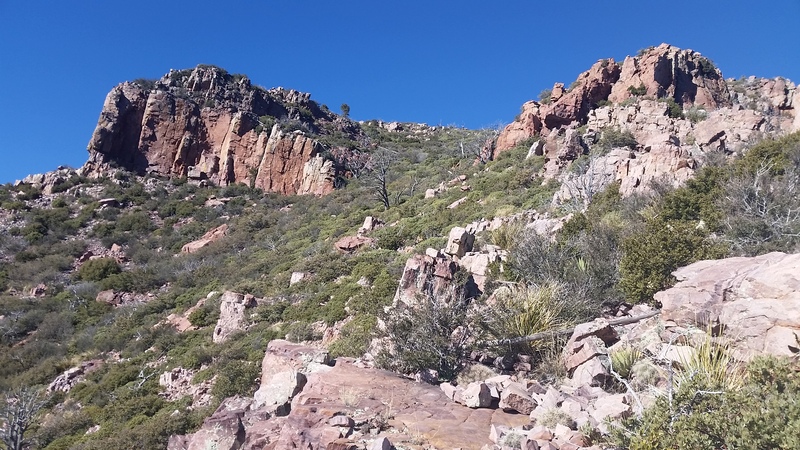 I stuck to the rock wall in places, found clear veins of runoff between plants that I ascended until finally I popped out past the rocks where I could see a “clear” path (covered in manzanita/snow) to the peak. Finally feeling like I had a clear shot to the summit (after so many false summits) I grinned in excitement and pushed on up to the peak. The views from the top were AMAZING! 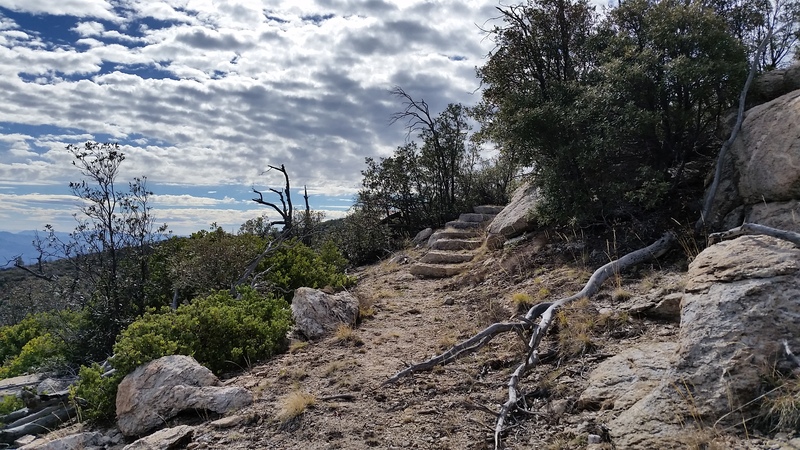 I Could see Four Peaks, Flatiron, Humphries, faint views of the valley and so much more. 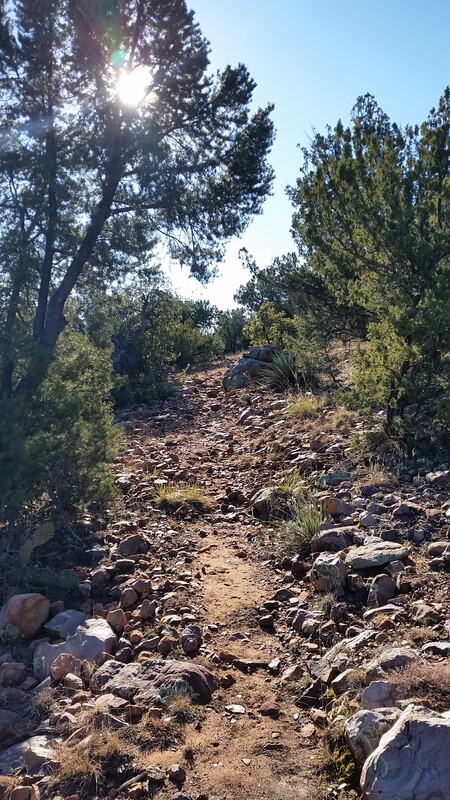 After taking in the views and a few pictures from the peak I decided to descend the 1 mile bushwhack back to the trail and return to the truck the same way i ascended. I am glad I did it in cooler weather, I know in warmer temps I would have been baked by the sun towards the peak! Another great trek safely completed. Gotta love that morning sun! Whew its still frosty in the shade! I may not be the only one using this trail! Man it was chilly in the shade!